Our 2008 annual meeting was well attended on Thursday October 30th. We had 42 NCN neighbors. Guest speakers included: Mayor John Dennis, Police Chief Jason Domkowski, Director of Development Chandler Poole, & Assistant Director of Development Allen Grady. We heard from each person about what was happening in WL & were able to voice many questions & concerns in relation to our neighborhood. 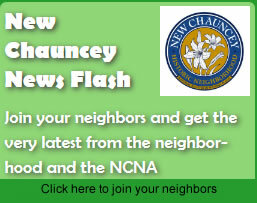 We also heard from Danny Weiss about our newly formed CHAUNC-PAC (political action committee). This non-partisan group will work with City leaders to keep the quality of life in NC high and help to voice the community concerns in the political arena. Throughout the evening Allen Grady, Chandler Poole (right), Police Chief Jason Domkowski (below, left), and Mayor John Dennis (below, right) openly discussed the residents’ issues and concerns. Overall attendees were encouraged by the discussion and all of the City leaders encouraged more of these types of discussions.